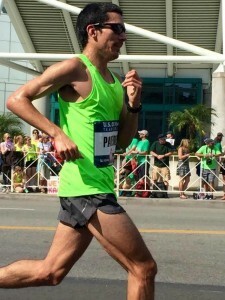 Olympic Trials marathon competitor Juan Paredes of East Los Angeles has entered the 13th annual St. Patrick’s Day 5K, taking place on March 13th in Redondo Beach. Although Paredes is a Southern California local born in Orange County, who started his running career at Santa Ana High School, this will be his first time running in Redondo Beach. This will also be his first race since running the Olympic Trials. This race benefits the American Cancer Society. The challenge of the marathon, however, was nothing compared to when he had to outrun a bear and its cub while at a training camp in Mammoth, California. Paredes was out on a run when he came across the bears, and quickly ran in the other direction as the bear seemed to pursue him. Thankfully, the bear didn’t chase him for long. “I think I ran a new record for about 30 seconds,” said Paredes of the incident. Paredes has a very successful running background, with a personal best of 14:33 in the 5K and 30:01 in the 10K. He ran for the University of Santa Barbara, and ran his best in the 1500 meter race with a time of 3:45. With the St. Patrick’s Day 5K being his first race since the marathon, Paredes is looking forward to testing his strength. “I hope to run the Saint Patrick’s Day 5K in under 15 minutes,” said Paredes. 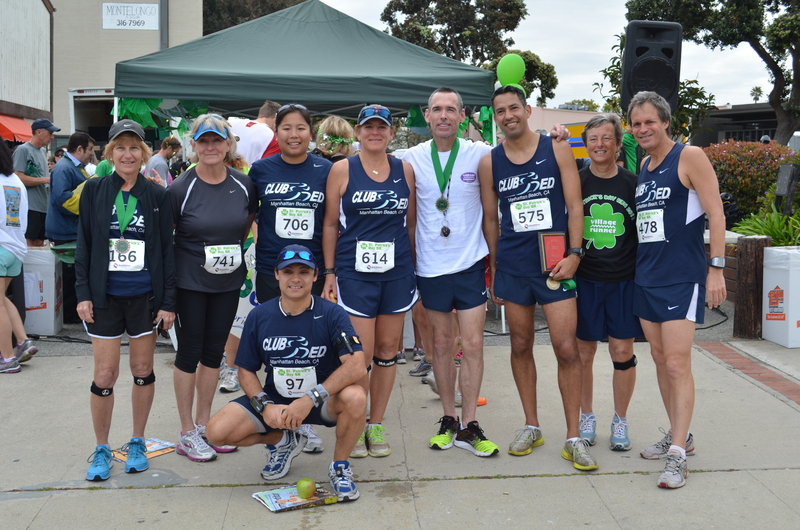 Olympic gold medalist and South Bay local Rebecca Soni of Redondo Beach has been named Official Co-Race Starter, along with Redondo Beach Mayor Steve Aspel, for the St. Patrick’s Day 5K. Redondo Beach Councilman Jeff Ginsberg will be running the 5K and introducing Mayor Aspel at the event. 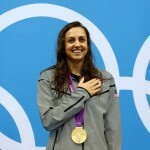 Soni, has won three Olympic gold medals and three Olympic silver medals during her swimming career. Along with being the honorary starter of the event, Soni will also be participating in the race. 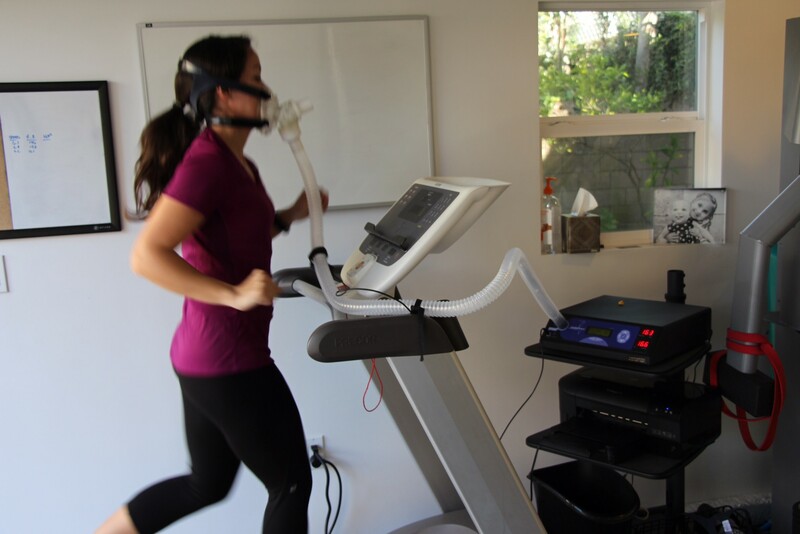 “Redondo Beach has provided me with a grown up playground for fitness and fun,” said Soni. The St. Patrick’s Day 5K has just added an exciting addition to this year’s event! 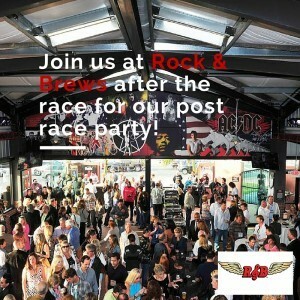 There will be an official post-race party held at Rock & Brews, on PCH in Redondo Beach, just a short few blocks walk from the race finish line. Rock & Brews will have great happy hour drink prices and a special breakfast menu including a French toast special. 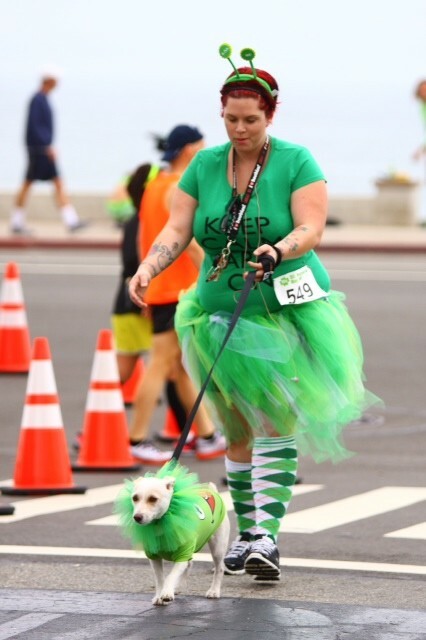 Entries are pouring in and 1,500 runners are anticipated to toe the line for the 13th annual St. Patrick’s Day 5K, taking place in Redondo Beach on March 13th. Ages range from the youngest runner ever entered, one years old, for the Kid’s Dash race to many senior runners. These include 24 runners entered in the 5K who are 70 years old and over, with three of them being 80, 84, and 85. Runners from all over the country are participating this year, including runners from Colorado, Virginia, Arizona, Illinois, Minnesota, New Hampshire, Michigan, and Missouri. 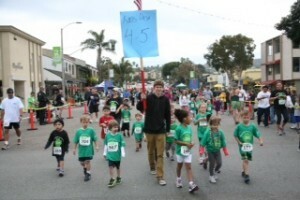 The Saint Patrick’s Day 5K race honors the memory of Chase Stecyk, who grew up in Redondo Beach. Race participants are encouraged to wear green in honor of Chase’s favorite color and for his favorite holiday, Saint Patrick’s Day. Chase was just eleven years old when he died of a tumor that paralyzed him from the waist down. In memory of Chase, Director Mike Ward has renamed the Kid’s Race to ‘The Chase Stecyk Leprechaun Dash for Gold’. Proceeds from the race will go to charities supporting the memory of Chase Stecyk, in addition to helping out local high school cross country and track teams. The Saint Patrick’s Day 5K charity beneficiary is the American Cancer Society. Partnering through Relay for Life, a percent of the proceeds will support the charity’s cancer research and free patient programs. The American Cancer Society will put these donations to work, investing in groundbreaking research in every type of cancer and providing free information and services to cancer patients and their caregivers. 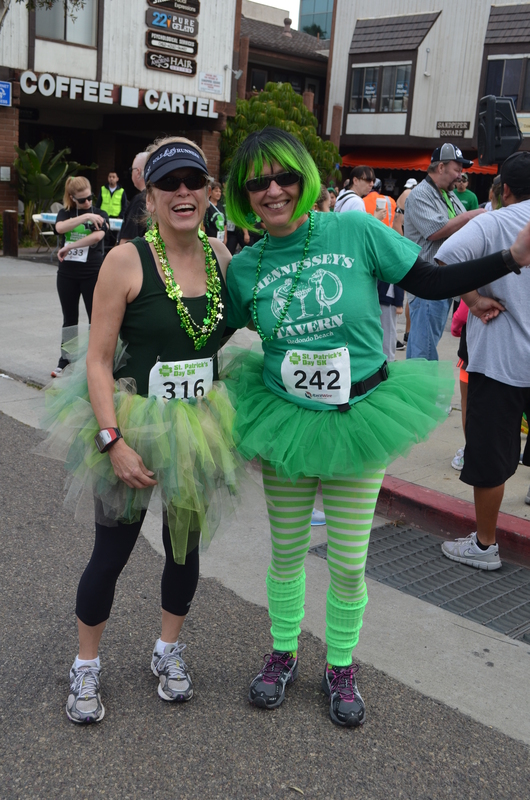 The 5K run/community walk and the Chase Stecyk Leprechaun Dash for Gold return to Redondo Beach on March 13th with the Race Expo starting at 6:30 am, the 5K at 8 am, and the kids races at 9:30 am in Riviera Village. All participating runners will receive a unique St. Patrick’s Day themed T-Shirt. The race also features chip-timing and age division awards. There will be cash prizes awarded to the top three male and female winners. The men’s overall winner and the women’s overall winner will get $200, second place, men and women, $125, and third place, men and women, $75. We’re proud to welcome our new 2016 race sponsor for the St. Patrick’s Day 5K, 3 Leaf Realty! Some of 3 Leaf Realty’s gorgeous properties are even along our beautiful course along the Esplanade with stunning views of the Pacific Ocean. Also, race supporters Healthy Spot pet stores and CenterCal will have a booth at the event. The St. Patrick’s Day 5K has become a tradition across the entire South Bay Beach Communities. The turnout is expected to be bigger than ever for the event’s “lucky 13th” year. Activities include shamrock face painting, green and gold outfits, and a costume contest, making this one of the most exciting St. Patrick’s Day events outside of Ireland! There will also be a 2-day Health and Fitness Expo, where local vendors and music will pump up race goers. 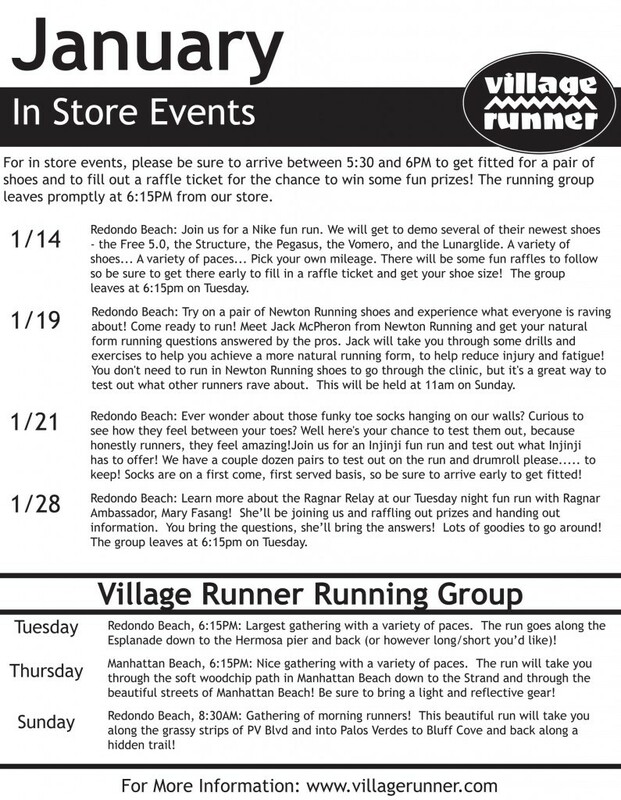 We have a bunch of great fun runs planned this month at the Village Runner in Redondo Beach in addition to our weekly fun runs! Plus, with the Olympic Marathon Trials and the Los Angeles Marathon around the corner, it’s going to be a great month to get motivated to get up and move! 🙂 For a printable file, click here. 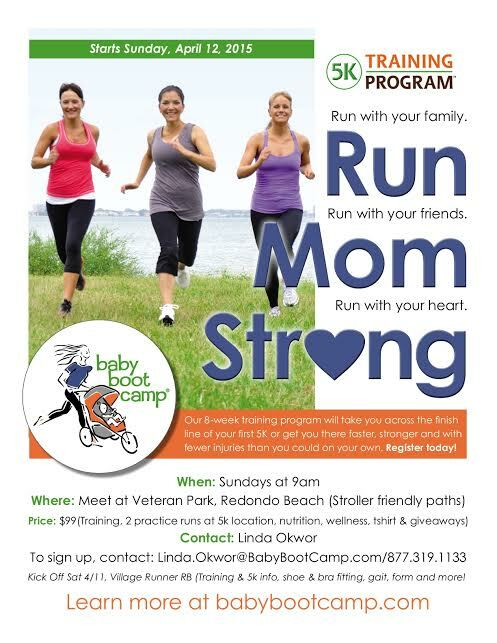 Baby Boot Camp Coming to Redondo Beach! Moms, Dads and families, join us for our 5k Training program. Whether training by yourself, with family, your kiddo or friends, our 5k program will take you across the finish line and get your there faster, stronger and with fewer injuries. Our paths are stroller friendly so make it a family outing! Kick Off: Sat 4/11, Village Runner RB (Training & 5k info, shoe & bra fitting, gait, form and more! Our kickoff will be on Saturday April 11th at Village Runner in Redondo Beach at 11am (11 -1pm). We will do special shoe and bra (for the ladies) fitting, go over training & 5k race, provide guidance on running, stroller and gait form, as well provide membership information, shirts, goodies and more. We will meet at Veteran Park for the training. Kids, babies and strollers are welcome. All adults must be registered and paid. 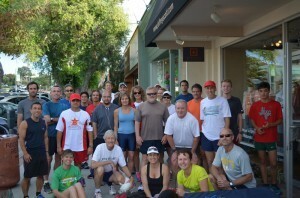 The 5k race that we are doing is the Club MomMe Stroll N’ Run on Sunday May 31st. Our awesome sponsors include: Village Runner, Club MomMe, Hulafrog, Mother Nuture Center, Wondertree Kids, South Bay Galleria, Plaza El Segundo, Beach Cities Health District, The Counter, Urbansitter.com, DoorDash.com, Suja, Fruigees, Gogo Squeez, Nature’s Bakery, Kind Snacks, Zico and Zouq Foods. They will be providing services, goodies and giveaways for our training and race. Please take the time to visit and support them!! 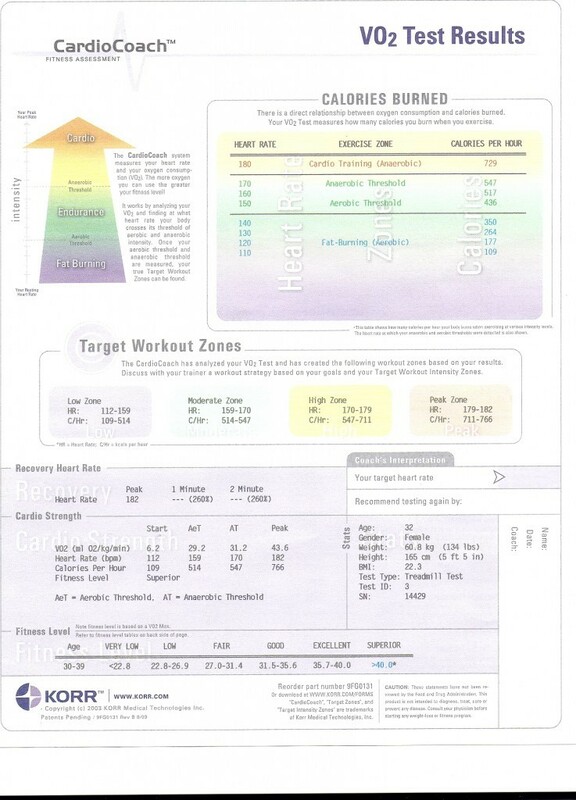 To Fitness, Fun and Family! Don’t forget to wear something reflective… or better yet, something with flashing lights! There are often lots of cars and looky loos so please be sure to stay aware of your surroundings while enjoying the lights! 🙂 We’ll make a couple stops to ensure the group stays together. Stick around after the fun run for some raffled prizes and goodies! See you soon and be sure to invite your friends! In case you need some motivation to keep you active through the Fall, check out this list of great local events coming up in the South Bay! 36th Riviera Village Summer Fest Completes Eclectic Entertainment Lineup! The complete list of bands and other entertainers has just been finalized for all three stages at the 36th Riviera Village Summer Festival, Jund 28-29th, 10 a.m.-7 p.m. in Redondo Beach. The event brings music, food, drink, Carnival Rides, and an Arts & Crafts Festival with over 200 booths. The Community Stage is a special place at this event, giving local music and dance groups the opportunity to perform in front of the hometown audience. The Community Stage highlights performances by Tiki McPherson, Brookelyn, Intensity Rocks, The Shakeh, Brian Asher, Dwain Roque Trio, Cana, Mecanica, Dance 1 Studio, Dance Forever, Jennifer Sombrotto, Colorblind Band, and Low Key Band. The live music selection on the two Main Music Stages feature a variety of bands including Skynyrd Reloaded, Addey Lane, Feed The Kitty, The Undercover Girls, Almost Famous, and Urban Dread which cover a wide range of music genres. All guests of the event will be admitted free of charge. The festival boasts a diverse array of food, including Greek, Asian, German, and Mexican cuisine, all located conveniently in the international food court. There will be Arts and Crafts booths, and also, Carnival Rides for children. This family-friendly event annually helps launch the summer season in the Beach Cities. Sierra Nevada Brewing Company has come aboard to present the Sierra Nevada beer garden at the event where a variety of Sierra Nevada brews will be featured. Car2Go is also a new Associate Sponsor of the event. Event attendees can travel to the festival hassle-free using Car2Go—it’s as simple as driving one of the company’s designated cars to your destination, dropping it off, and never worrying about it again. The variety of activities the festival provides gives guests the opportunity to be adventurous and try new things or simply relax with a drink and listen to the music performances. This laid-back atmosphere gives the festival a comfortable, community feel in spite of the fact that it has many characteristics of a sophisticated music festival. There will be free shuttles to the festival for the guests who park at South and West High. The “No-Cost Bike Corral” also offers free bike valet parking for all those who ride to the festival, thereby promoting health and benefiting the environment. Who wouldn’t want to bike through the beautiful Riviera Village during the summertime, anyway? 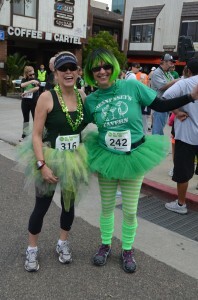 Curious about the St. Patrick’s Day 5K race? Check out this great video put together by Monarch TV! Thanks to Positive Energy Physical Therapy in Redondo Beach for race clips from last year’s event. This is a fast, flat course, and let’s not forget about the ocean views! Sign up by Friday , February 13th before registration prices go up! Don’t forget to wear your green! 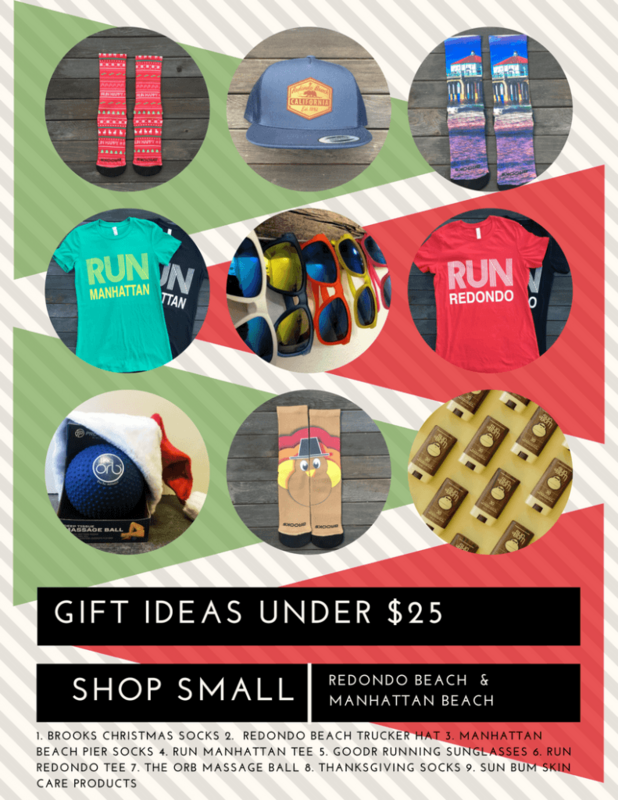 Nike, Newton, and Injinji, Oh My! 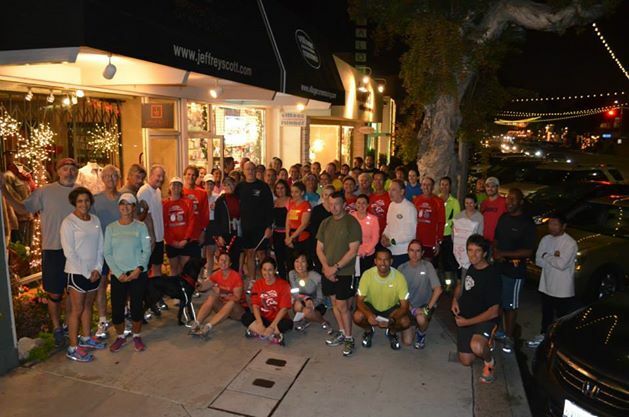 We have a great January lineup for our South Bay runners! 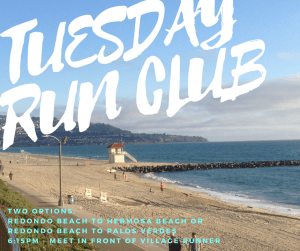 Plus, let’s not forget that the Redondo Beach Super Bowl Sunday 10K / 5K is right around the corner so join us every week to get some training in and have some fun with it! You might just stop calling it a workout, and start calling it a night out with friends. For more details, to RSVP, and to invite friends, please click on the links above. If you’d like a full, printable flier of upcoming events, click on the image below.